Last night we were supposed to go to our friend's house for dinner. and didn't give dinner another thought. She called to say her daughter was throwing up and had a fever. A lot of throwing up. 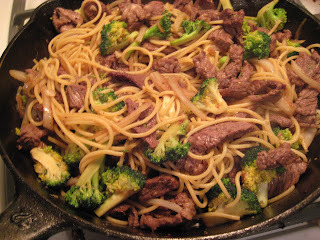 BUT, I had beef and broccoli base in the freezer (beef strips frozen in sauce) with a bag of frozen broccoli. and tossed the frozen chunk into the cast iron pan. In about a half hour we had rice ready and beef and broccoli stir fry. If I hadn't frozen it? I would have run to Taco Bell. And spent more money not budgeted for that. Awesome save! It looks yummy!